Anyone who lives in Australia, especially Brisbane, has probably seen a Coffee Club. For those that haven’t, it is a chain cafe that was started here in Brisbane that has not built its business on adding sugary crap to coffee. The other weekend one of my aunts was up from Sydney, so we all went out to the same place my Dad goes to every time we do this. 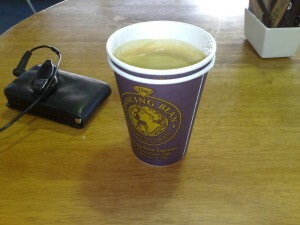 I found myself at the Racecourse Road Coffee Club, Ascot. I eventually made my way through two long blacks and their big breakfast. Personally I have found that their coffee is not the best, but it is generally consistent across their stores, and the food is fairly decent. I ended up having their huge breakfast. I was a little disappointed when I was not allowed to swap the eggs, which I don’t eat, for something that I did. Usually, I can do this. Cafine Long Black, with a giant cookie. I have recently finished up on a contract with the Department of Education, Training and the Arts. I was employed as a content producer, and trust me, it is not as fun as it sounds. However, some of the people in the office were great and the money was not too bad either. The coffee shop just around the corner was pretty good too. The place is called Cafine, and their long blacks are pretty good. 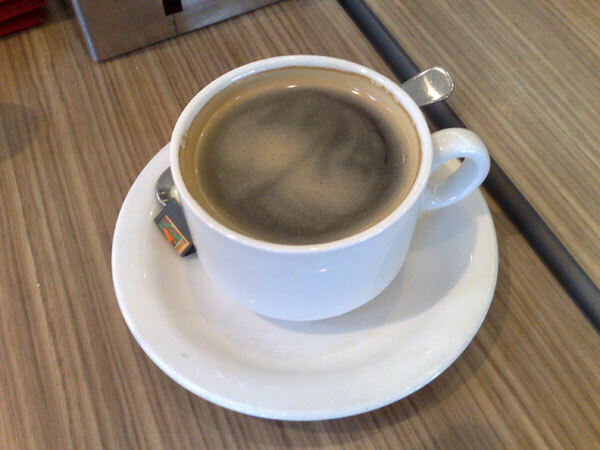 They can make a strong and drinkable long black, without it needing sugar. 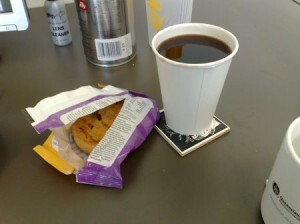 They did not make that cookie though, that was from one of the vending machines in the office.